At 9:30am today, inside the Vatican Basilica, the Holy Father, Pope Francis presided over the celebration of the Mass of Chrism for the Diocese of Rome. 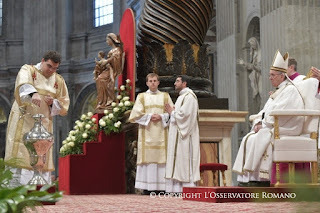 The Mass of Chrism was concelebrated by the Holy Father along with Cardinals, Bishops and Presbyters (diocesan and religious) who are present in Rome. During the Eucharistic celebration, the priests who were present renewed the promises they made at the moment of their Ordination; then the Oil of the Infirm (Sick), the Oil of Catechumens and the Holy Chrism were blessed. The Spirit of the Lord is upon me, because he has anointed me to preach good news to the poor. He has sent me to proclaim release to the captives and recovering of sight to the blind, to set at liberty those who are oppressed (Lk 4:18). Jesus, anointed by the Spirit, brings good news to the poor. Everything he proclaims, and we priests too proclaim, is good news. News full of the joy of the Gospel – the joy of those anointed in their sins with the oil of forgiveness and anointed in their charism with the oil of mission, in order to anoint others in turn. The phrase good news might appear as just another way of saying the Gospel. Yet those words point to something essential: the joy of the Gospel. The Gospel is good news because it is, in essence, a message of joy. The good news is the precious pearl of which we read in the Gospel. It is not a thing but a mission. This is evident to anyone who has experienced the delightful and comforting joy of evangelizing (Evangelii Gaudium, 10). The good news is born of Anointing. Jesus’ first great priestly anointing took place, by the power of the Holy Spirit, in the womb of Mary. The good news of the Annunciation inspired the Virgin Mother to sing her Magnificat. It filled the heart of Joseph, her spouse, with sacred silence, and it made John leap for joy in the womb of Elizabeth, his mother. In today’s Gospel, Jesus returns to Nazareth and the joy of the Spirit renews that Anointing in the little synagogue of that town: the Spirit descends and is poured out upon him, anointing him with the oil of gladness (cf Ps 45:8). The truth of the good news can never be merely abstract, incapable of taking concrete shape in people’s lives because they feel more comfortable seeing it printed in books. The mercy of the good news can never be a false commiseration, one that leaves sinners in their misery without holding out a hand to lift them up and help them take a step in the direction of change. This message can never be gloomy or indifferent, for it expresses a joy that is completely personal. It is the joy of the Father, who desires that none of his little ones be lost (Evangelii Gaudium, 237). It is the joy of Jesus, who sees that the poor have the good news preached to them, and that the little ones go out to preach the message in turn (EG, 5) The joys of the Gospel are special joys. I say joys in the plural, for they are many and varied, depending on how the Spirit chooses to communicate them, in every age, to every person and in every culture. They need to be poured into new wineskins, the ones the Lord speaks of in expressing the newness of his message. I would like to share with you, dear priests, dear brothers, three images or icons of those new wineskins in which the good news is kept fresh, without turning sour but being poured out in abundance. A second icon of the good news is the jug with its wooden ladle that the Samaritan woman carried on her head in the midday sun (cf Jn 4:5-30). It speaks to us of something crucial: the importance of concrete situations. The Lord, the Source of Living Water, had no means of drawing the water to quench his thirst. So the Samaritan woman drew the water with her jug, and with her ladle she sated the Lord’s thirst. She sated it even more by concretely confessing her sins. By mercifully shaking the vessel of that Samaritan women’s soul, the Holy Spirit overflowed upon all the people of that small town, who asked the Lord to stay with them. The Lord gave us another new vessel or wineskin full of this inclusive concreteness in that Samaritan soul who was Mother Teresa. He called to her and told her: I am thirsty. He said: My child, come, take me to the hovels of the poor. Come, be my light. I cannot do this alone. They do not know me, and that is why they do not love me. Bring me to them. Mother Teresa, starting with one concrete person, thanks to her smile and her way of touching their wounds, brought the good news to all. The third icon of the good news is the fathomless vessel of the Lord’s pierced Heart: his utter meekness, humility and poverty which draw all people to himself. From him we have to learn that announcing a great joy to the poor can only be done in a respectful, humble, and even humbling, way. Evangelization cannot be presumptuous. The integrity of the truth cannot be rigid. The Spirit proclaims and teaches the whole truth (cf Jn 16:3), and he is not afraid to do this one sip at a time. The Spirit tells us in every situation what we need to say to our enemies (cf Mt 10:19), and at those times he illumines our every small step forward. This meekness and integrity gives joy to the poor, revives sinners, and grants relief to those oppressed by the devil. Dear priests, as we contemplate and drink from these three new wineskins, may the good news find in us that contagious fullness which Our Lady radiates with her whole being, the inclusive concreteness of the story of the Samaritan woman, and the utter meekness whereby the Holy Spirit ceaselessly wells up and flows forth from the pierced heart of Jesus our Lord. Do our hearts burn within us?